These crispy, crunchy Amaretto Coconut Biscotti are perfect for dipping in a hot cup of coffee, tea or hot chocolate. As a bonus, the amaretto salted caramel drizzle will flavor your beverage as well as add a salty, caramel sweetness to these crunchy cookies. Libational Recipes. 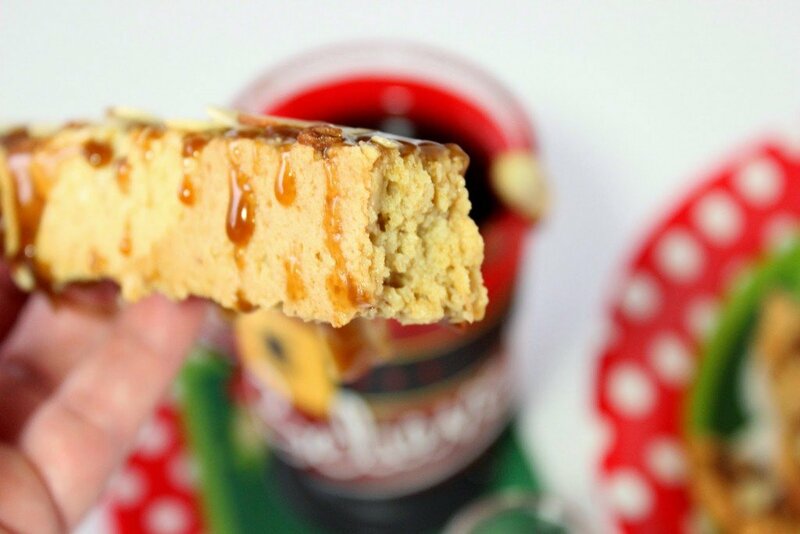 That’s the theme of this week’s #SundaySupper, and I’m super excited to participate with my recipe for Amaretto Coconut Biscotti with Amaretto Salted Caramel Drizzle. When it comes to libational recipes I’ve actually been cooking with wine a lot lately, thanks to all the Gallo Family Vineyard’s sponsored posts I’ve been privileged to participate in. I love the flavor wine imparts in all the savory dishes I’ve made over the past several months. Dishes like; Classic Swiss Fondue, Man Burgers Stuffed with Pinot Nior and Caramelized Onions, Garlic Mushrooms in Red Wine Sauce, and Alfredo Macaroni and Cheese with White Wine. 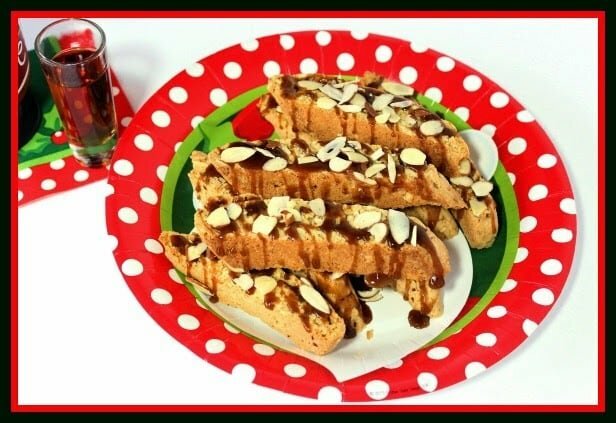 For this theme, however, I wanted to go in the direction of a sweet for dessert so I chose to work with the classic almond flavored liquor… amaretto! Oooh. Aaah! I decided to add coconut into the dough because, well, why not? I happen to love coconut but if you’re not a fan, by all means, leave it out. -In a large dry skillet over medium heat, toast 1 cup of the slivered almonds and the coconut, stirring constantly until lightly browned. Remove from heat and set aside. 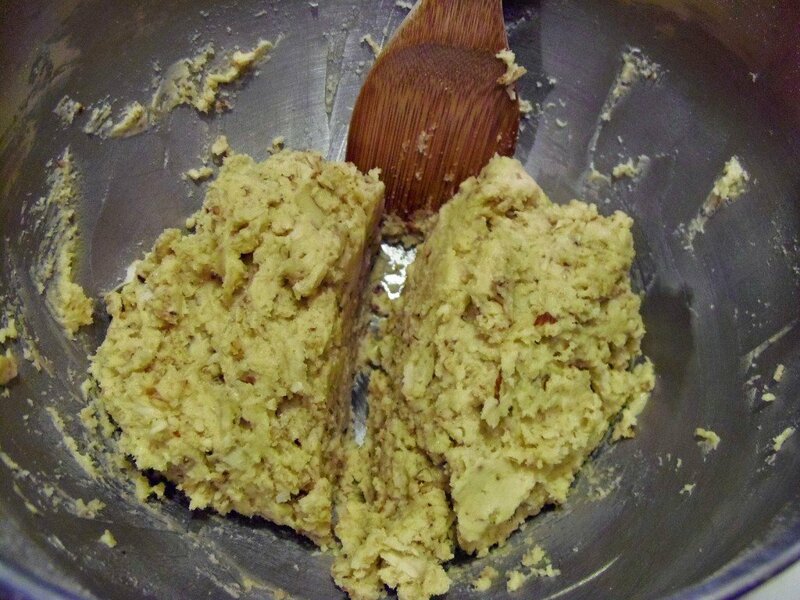 -In a large bowl, whisk together the flour, baking powder, and salt. Set aside. 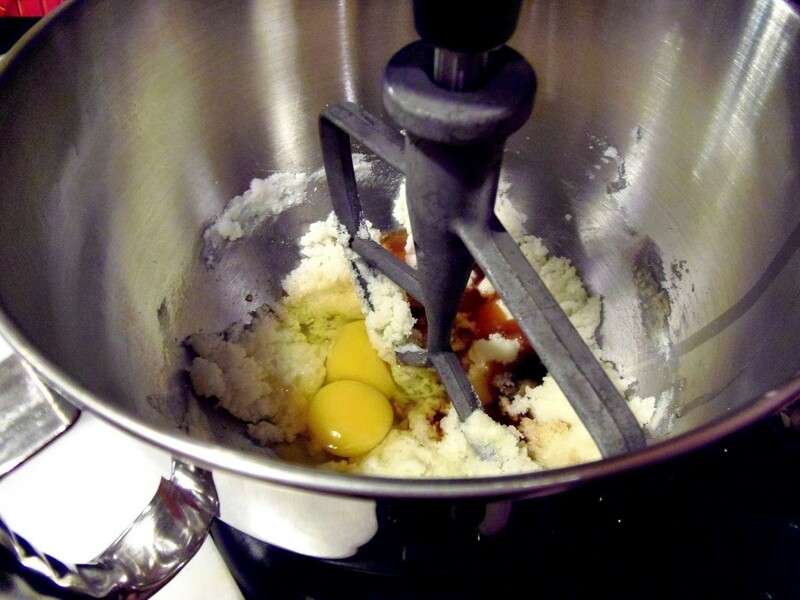 -In the bowl of a stand mixer (or a large bowl with a hand mixer), beat together the butter and sugar and then mix in the eggs, vanilla extract, almond extract, and amaretto. 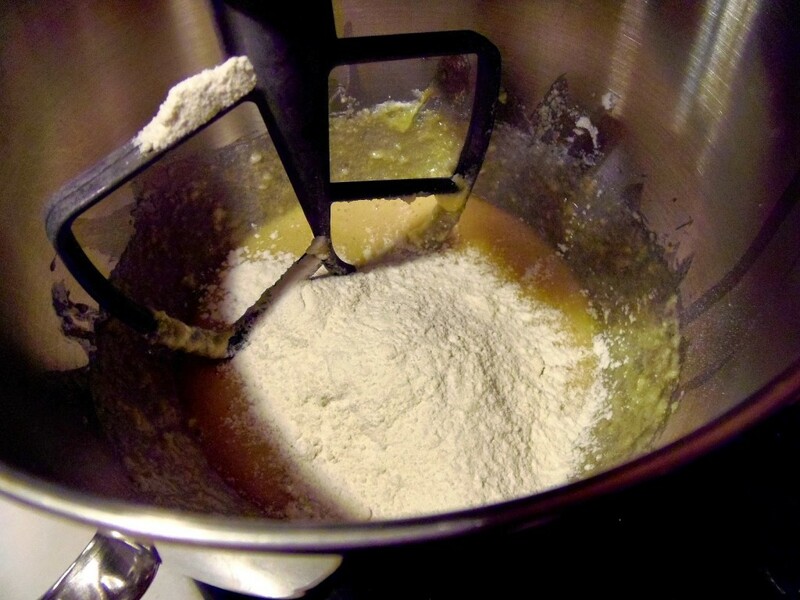 -Blend in the flour mixture (1/3 at a time), until fully incorporated but do not overbeat. 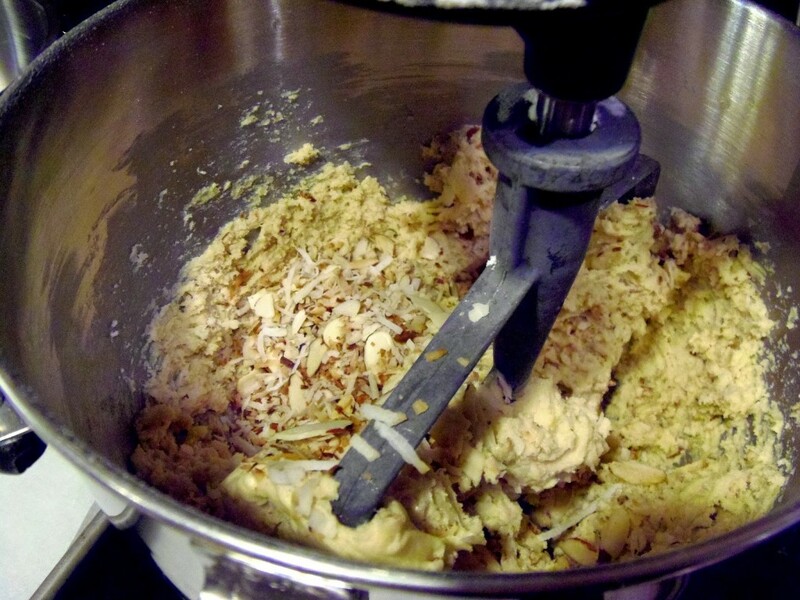 -Blend in the cooled toasted almond and coconut mixture until just combined. 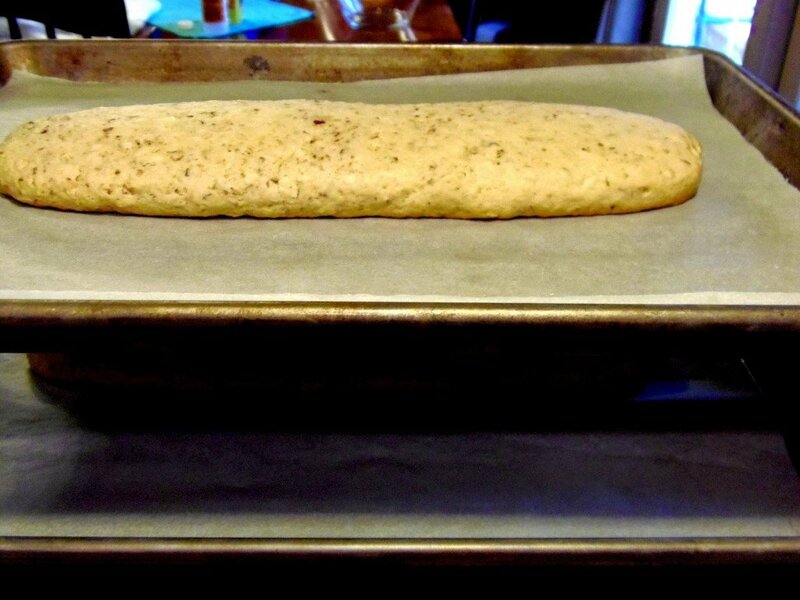 -Divide the dough in half and form each half into a 3″ x 12″ log on two parchment-lined baking sheets. -Bake in a preheated 350-degree oven for 25 minutes. -Remove from the oven and cool the logs for about 15 minutes. -Reduce the oven temperature to 275 degrees. -Place the logs on a cutting board and use a serrated knife to carefully slice each log diagonally into 1″ slices. Return the cut cookies to the baking sheets and bake for 25 minutes and then flip each cookie and bake again for an additional 25 minutes until dry and lightly golden. -Remove from the oven and cool completely. -In a medium saucepan over medium heat, bring the first 5 ingredients to a boil, stirring constantly (about 4 minutes). 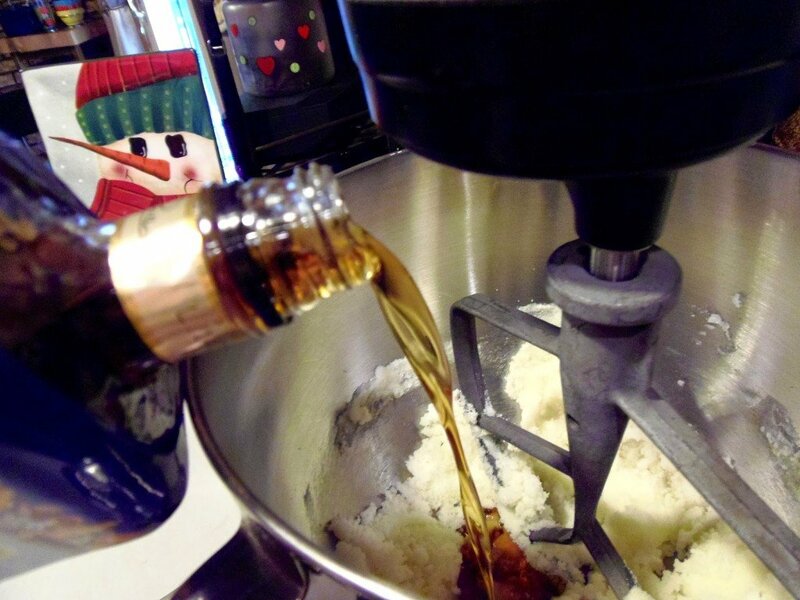 -Remove the sauce from the heat and stir in the amaretto and salt. 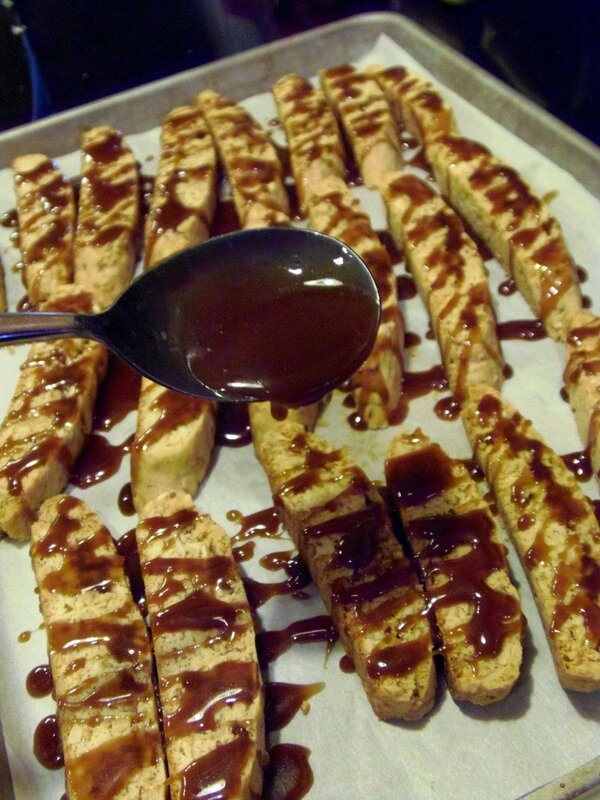 -Allow the sauce to cool slightly and then drizzle the amaretto caramel over the cooled biscotti. 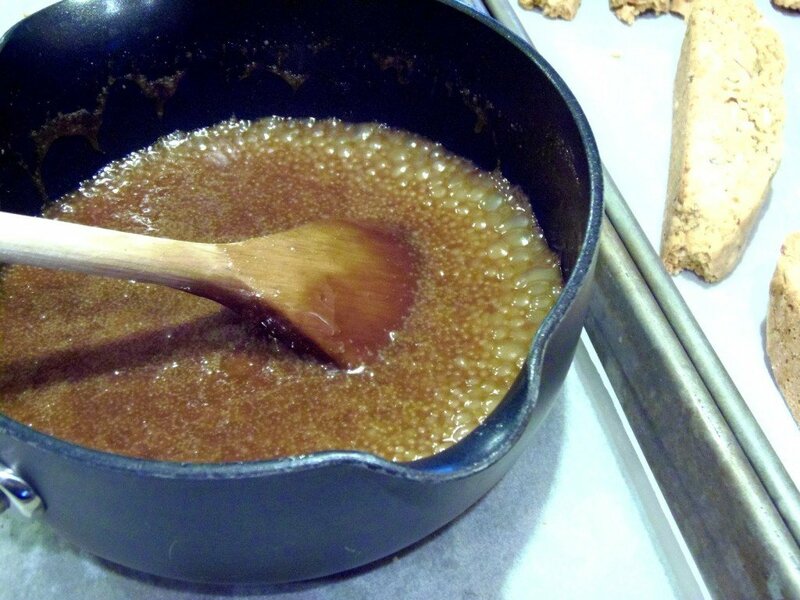 -Sprinkle the remaining ½ cup slivered almonds over the amaretto caramel. 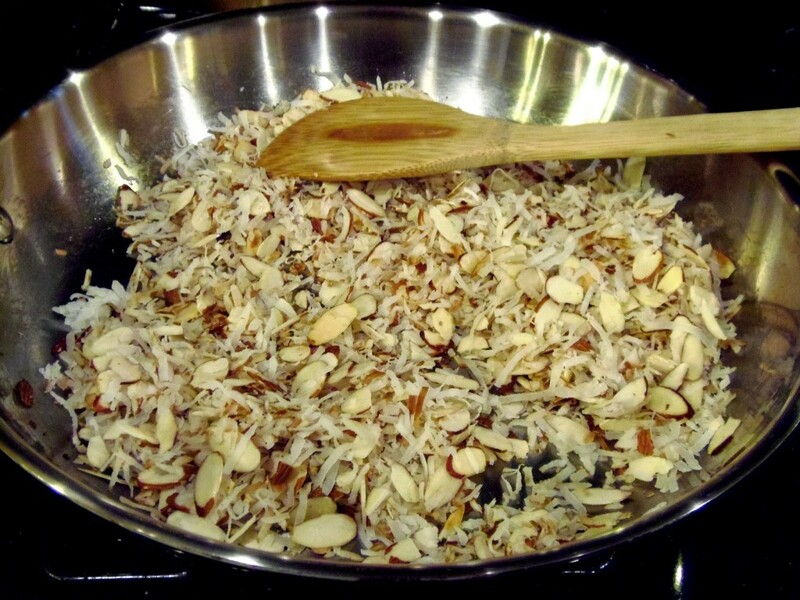 Toast the almonds and coconut in a dry saute pan and cool. 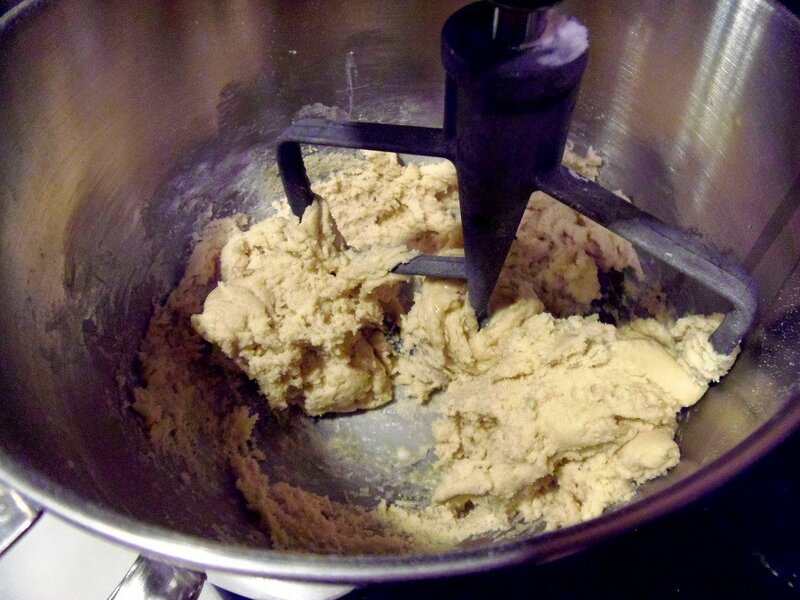 Blend together butter, sugar, extracts and amaretto. Blend in the flour and the cooled toasted almonds and coconut. 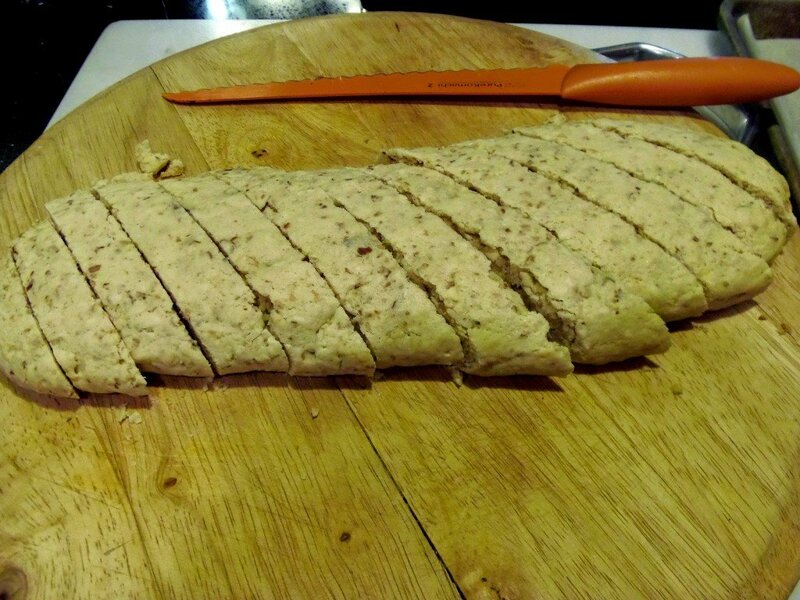 Divide the dough in half and form each half into 3″ x 12″ logs. Bake until slightly puffed. Slice each pre-baked log on the diagonal into 1″ slices. 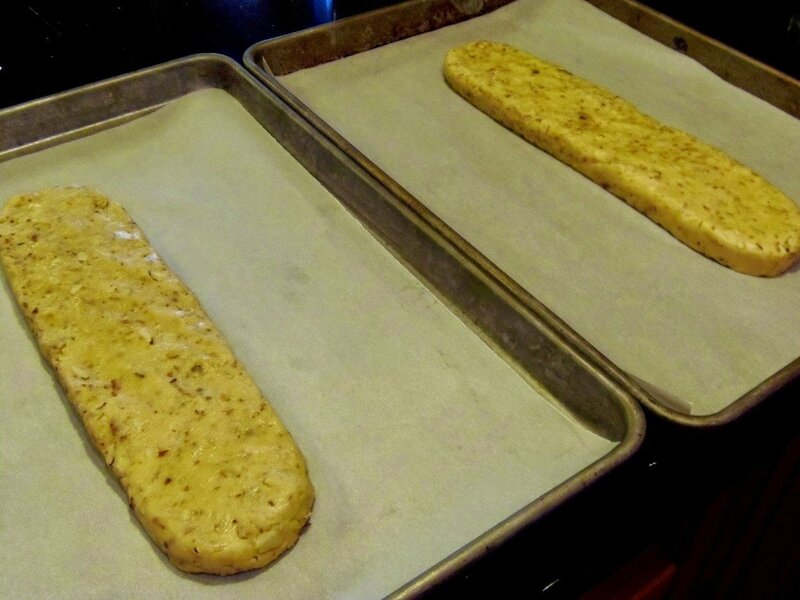 Return the slices to the baking sheets and bake again in a heat reduced oven flipping the biscotti halfway through the baking. Cool completely. 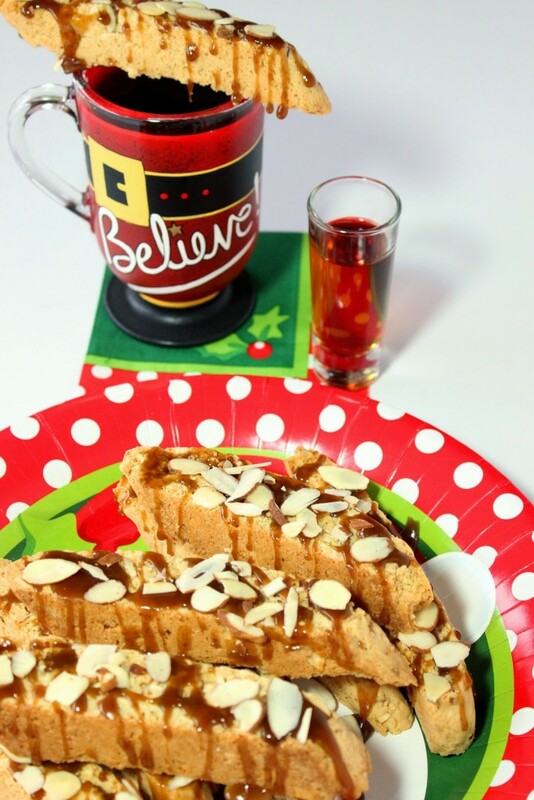 Drizzle the cooled and cut biscotti with the amaretto salted caramel and top with the remaining sliced almonds. Seriously the best biscotti I've seen in ages. Awesome recipe. Amaretto, coconut AND a caramel drizzle???? I need a pile of this wonderful biscotti in my world! That caramel drizzle will sell me every time! And what great flavors IN your biscotti too, Reneé! Ohhh my!! 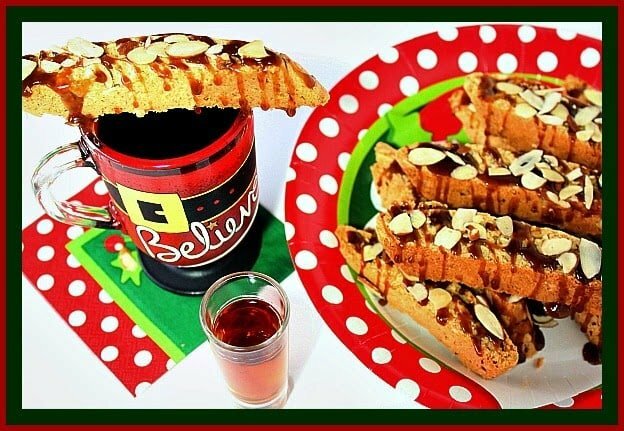 You have 3 of my favorite things in here, I think I am adding Biscotti to my holiday baking! Love biscotti and your look decadently good! Gorgeous biscotti! I want extra caramel on mine please! I'm like the worst baker ever, but I have been known to make a good biscotti. Thanks for a GREAT sounding recipe. Happy Holidays to you and your family Renee. The first drink I ever ordered at a night club was an Amaretto Sour, so I understand your sentiment! What a great biscotti – and your drizzle looks amazing! Looks like your Happy Hour research turned into one happy coffee dipping cookie, Renee =) Love the idea of enjoying the flavor of the biscotti pre and post dunk! Soooo crazy crunchy! I'm swooning just looking at these 🙂 saving them in my cookies file! Good sweet twist! As always, I love your step-by-step pictures. I can see myself making this! 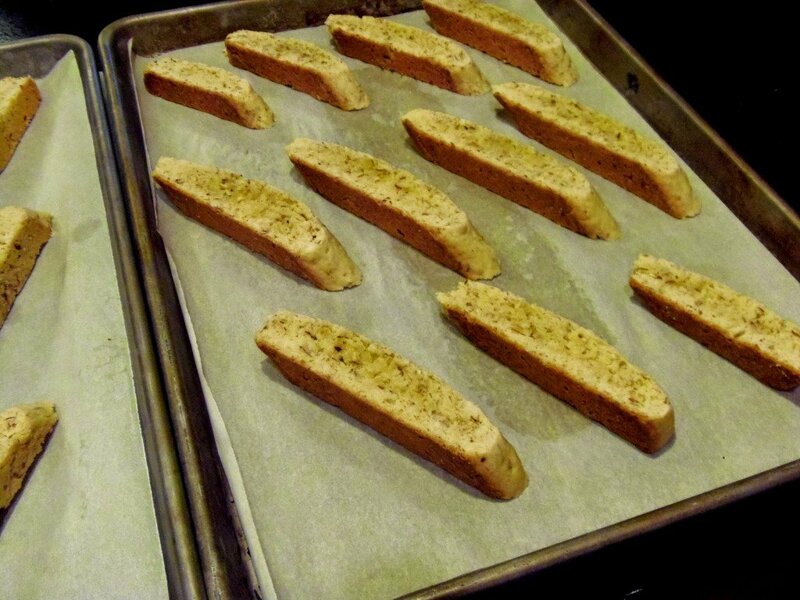 I have never even thought about making my own Biscotti. Wow! These look amazing!! You make everything look so easy, Renee!! We've been on a huge amaretto kick this holiday season! These look incredible! You had me at Amaretto ; ) I have some homemade Amaretto on hand and I think these biscotti have to happen. I just made an Amaretto breakfast casserole and I have a lot left in the jug, so these biscotti are perfect – thank you! Toasting almonds or any nuts for that matter makes them so much better in recipes. This looks lovely! I remember being smitten with amaretto in my early twenties. 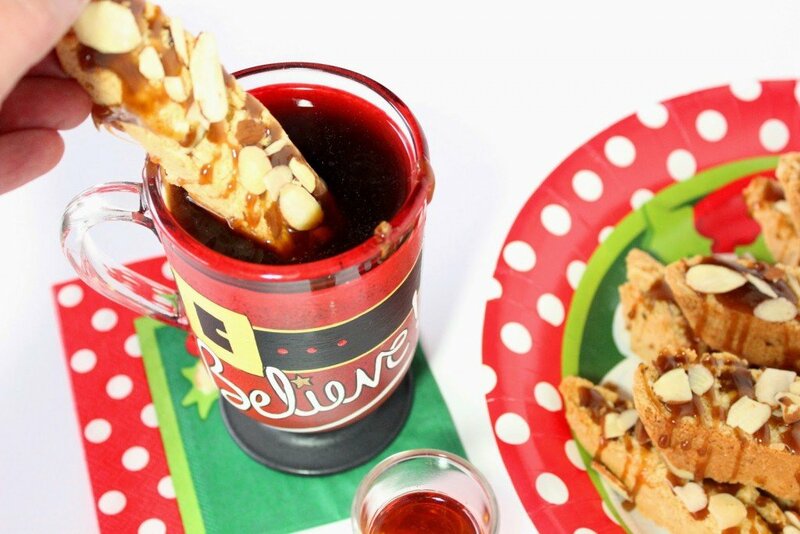 While I don't think I would choose to drink it straight anymore, I could happily dig into these biscotti! I LOVE Amaretto. I want to put it in everything! Well. At least half the stuff. Frangelico goes in the other half. 😉 And these biscotti look like the perfect use for it! Now that is a festive biscotti! Love Amaretto too! Mmm, a tasty looking biscotti! Biscotti is the perfect addition to coffee. I wish I had one this morning. Oh, that drippy caramel has me swooning a little over here. And I love amaretto…I'd probably covet a box of these all for myself! I love love love biscotti! this version looks out of this world, with that amazing drizzle. I love having a biscotti with my afternoon coffee. These look delicious! What a gorgeous Biscotti! Perfect with a cup of coffee or tea! Such gorgeous biscotti! I need these with my coffee ASAP!